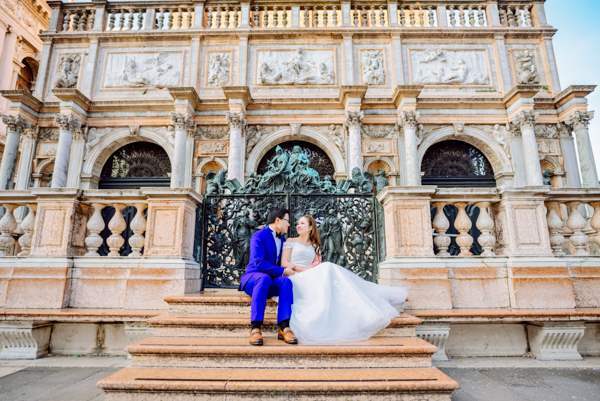 A lot of couples from all other the world choose Venice as the destination to take their pre wedding photos. It is one of most beautiful and special places in Europe. If you are looking for a professional, creative and experienced pre wedding photographer, you are on the right website. We provide only high quality photo services with an excellent result. 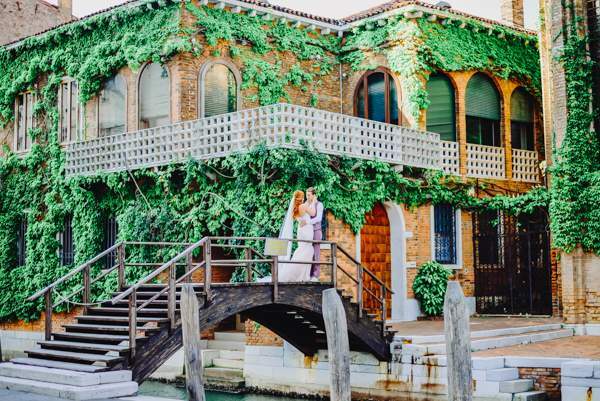 Venice offers a variety of stunning locations for a pre wedding photo shoot. Some hotels have luxury interiors that are amazing for the pictures. For example, hotel Danieli is situated inside ancient venetian palace. If you stay there, we can do some shots inside the hotel. Venice is a dream destination that is full of fabulous palaces, pretty bridges and channels that create a unique scenery. Capture your pre wedding story with the best pre wedding Venice photographer. Have a look at the page with frequently asked questions. What is a pre wedding photo shooting? It is a couple photo session with your pre wedding Venice photographer. The pictures could be fun or romantic, posed and candid. In many countries there is a tradition to make a long pre wedding photo shoot. After the couple will demonstrate the photos during their wedding to the guests. It is also a great opportunity to create photos for your Save the Date cards. They will be unique and really nice. 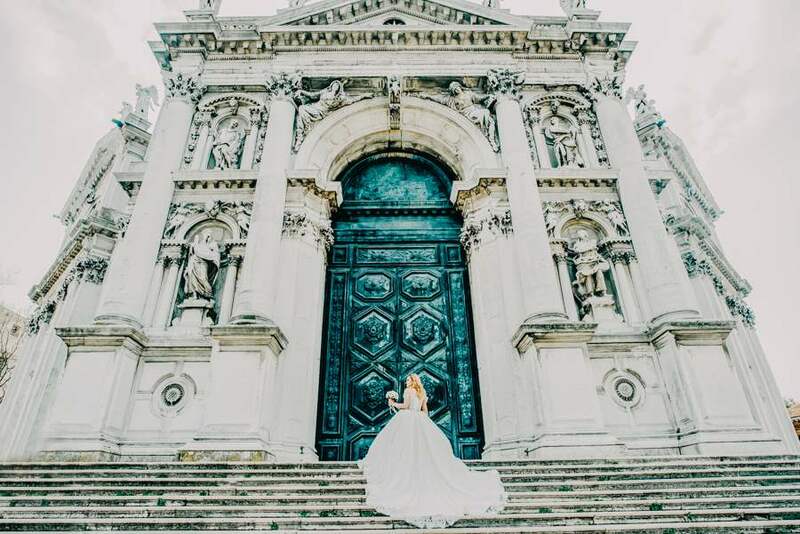 I believe that it's very important to book a local photographer for a pre wedding photo shoot in Venice. Only locals can advise best locations and ideas. Contact us to inquire about the prices and availability. When is the best time for a pre wedding session? Usually pre wedding photo shoot is a very long one. Most couples book 4, 6 or 8 hours. In this case we divide our time for two parts - sunset and sunrise. It's possible to do the shoot in two different days or on the same day. Sunrise or sunset is the best time for a photo session. During the sunrise the city is empty and it's possible to take pictures on the most famous and iconic places like St Mark's Square with the famous pierce with blue gondolas, Doge's Palace, Bridge of Sights, ancient galleries with arches. After you can take a breakfast at coffee shop Florian - it's the most ancient one in Venice. The interiors are so gorgeous, that you will fall in love with this place immediately. Sunset is perfect time to discover authentic places with your pre wedding Venice photographer (bridges, channels, narrow streets). Another good idea is to do late afternoon part on the Burano Island. It's a small island full of colorful houses. It is situated in 40 minutes by vaporetto (it's a public transport) from the main part of Venice. You can get there also by water taxi. How does pre wedding session work? 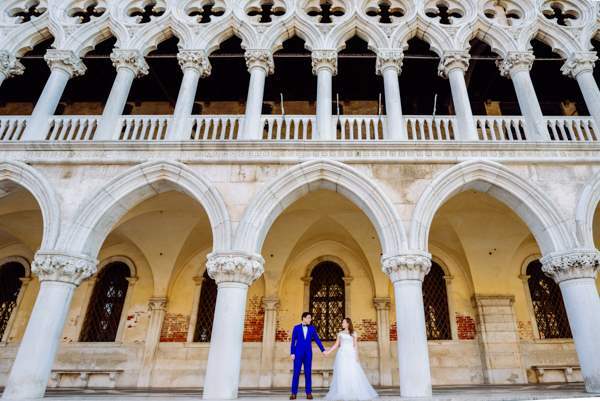 After booking your pre wedding Venice photographer, we will discuss your preferences for the places and areas that you would like to cover. If you have your wish list of the locations, please send me it in advance, and we will plan our route. A lot of couples want to make also a gondola ride with pre wedding Venice photographer. Gondolas start working at 9:30 am and finish at late night. The price for the gondola ride is 80 euros during the day and 100 euros after 6:30 pm. I will help you to choose the gondola's best station with the most interesting route. Our goal is to tell your amazing fabulous story in Venice. We will be walking around the city, having fun and I will be capturing your precious moments together. The style will be mixed of posed and candid images. We can't wait to make unforgettable your pre wedding ! Contact us and we will respond you as soon as possible.